New Striping in the Bike Lane: friend or foe? BikeCommuters.com > Advanced Commuter Tips > New Striping in the Bike Lane: friend or foe? Construction season nears its end, and I’m noticing some new bike / ped lane striping going on in Chicago — along my commuting route! 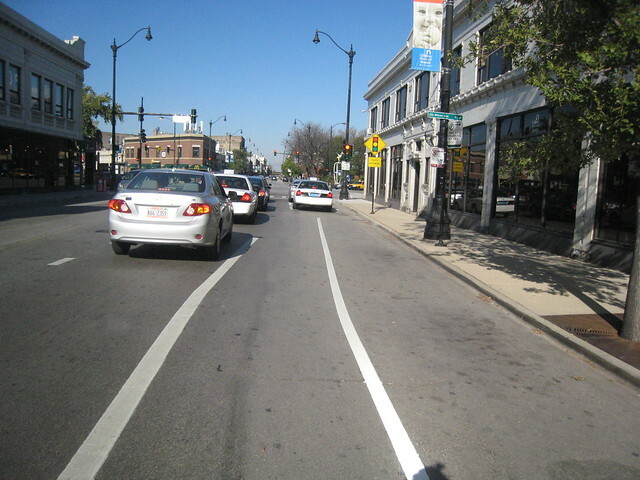 It’s awesome to see fresh new white lines and newly painted bike images in the bike lane. I took a photo of the crew painting the new bike markers in my lane during my morning commute; they were happy to pose for a photo op. The bright white stripe of demarcation is so much more visible at night and I have noticed that motorists do not encroach as much on my designated road space – at least they seem to notice the bike lane. Of course, that doesn’t keep me from moving beyond my narrow lane; if road conditions in the bike lane are hazardous or if a car is double-parked or there’s a threat of dooring, then I reserve my right to ride outside of the bike lane and to take the lane of motor vehicle traffic for my own safety. The new bike lane installation is already underway. 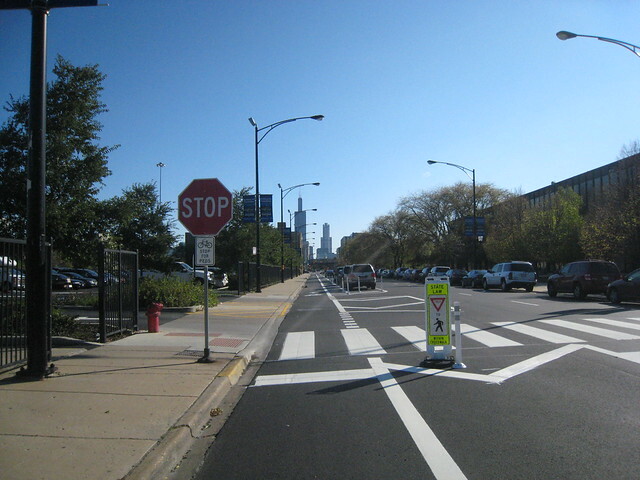 Miriam and I explored the first stretch of protected bike lanes on Kinzie during her visit to Chicago. 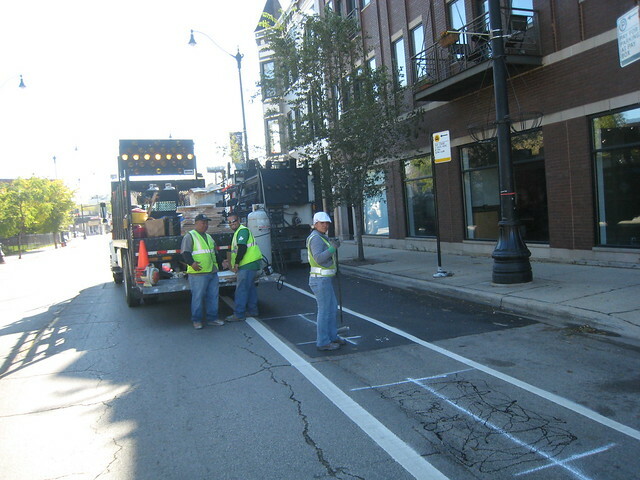 Most recently, the city’s resurfacing project on Jackson has led to a second protected bike lane being installed on Jackson Boulevard from Western Avenue to Halsted Street. The city is evaluating road projects already in the works and has been able to more quickly and affordably get these first protected bike lanes in place in a fairly efficient fashion. 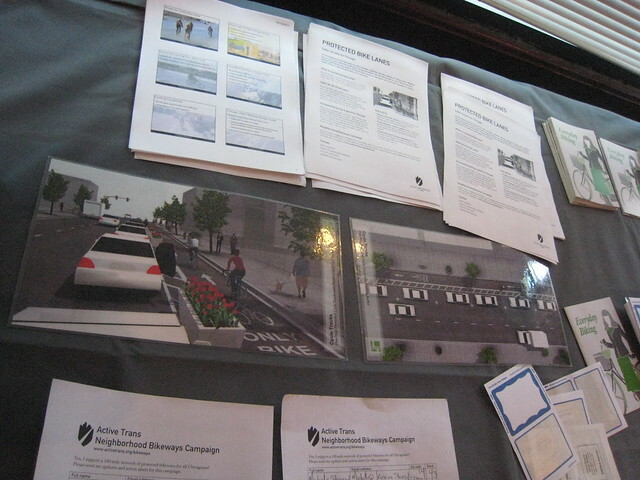 Earlier this month I attended the community Bikeways (both the 101 and 201) sessions about all that goes into the engineering and planning of such bike lane infrastructure. And there will be much planning in the coming months! See how the bike lane ends as it approaches the intersection…. As the city continues to plan out the new Bikeways, let’s hope that such dead zones of infrastructure get addressed. The best way to see the bike infrastructure installed how and where you want is to get involved and attend the future community meetings. The city’s resolve to make Chicago a more bike and pedestrian friendly place has to start somewhere. 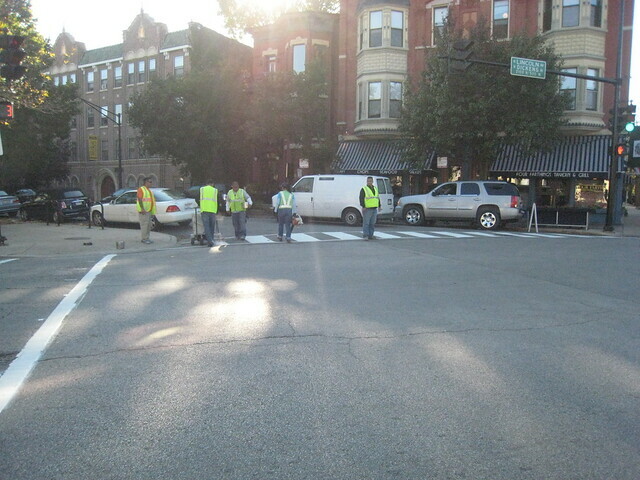 I like seeing the smiling workers striping pedestrian crosswalks and bike lanes — a small though noticeable sign to motorists that the streets are not ALL theirs. That’s fantastic! I hope all who have access to these wonderful spaces appreciate them! It’s a few hundred miles to the nearest bike lane for me, unfortunately. To me, the mere presence of such a lane – even if it’s just some marks on pavement – means you ARE recognized as a contingent of the traffic flow. Of course, the sights of the “protected lanes” make me want to move to where they are when I can. lol. Bike lanes which end a few car lengths before a signaled intersection — leaving you competing for the right-hand lane with two tons of rolling steel — are some of my LEAST favorite things about marked bike lanes. 1) A lot of municipalities take a “well, we painted them and now our job is done” mentality…and those few bike lanes become a repository for broken glass, roadkill, needles, etc. We’d love it if you actually swept the lanes periodically, cities (and I’m talking to you, Tampa, being one of the worst offenders I’ve experienced)! 2) Those cities that pass a “ride in the bike lane ONLY” ordinance. Yes, if they’re available we should use them, but to force us to stay inside the lines except under extreme circumstances rubs me the wrong way. And here I got all excited about 15 sharrow markings in my whole town! Meh. I suppose it depends on a bunch of factors, but at least here in Kansas City, I think they’re mostly useless. Pros: Bikes have a visible demarcation zone where cars are less likely to be. That’s it. There’s one pro. It’s no guarantee that someone won’t zip into it instead of waiting behind someone that’s trying to make a left turn, or that someone won’t stop or park on the bike lane. It’s no guarantee that the roadway will be maintained and free of craters, or that the street sweeper won’t fill the bike lane with debris. The Cons are many: often times, these parts of the pavement ARE horribly neglected. Extra time and money go into painting lines that further reinforce a few bad behaviors such as segregation, intolerance, and “bike routes” on roads that don’t make a lot of sense. That’s right: Most bike lanes I see are painted on roads that are really best used for car-centric transportation, when cyclists could easily use friendlier residential byways adjacent to these mini-highways. Without the extra paint, you’d still have a wide-outer-lane that generally beats the alternative. I’m a fan of wide lanes. When perhaps 10 cyclists per day in the peak season might use the bicycle lane for actually getting around, it just doesn’t make a lot of sense. In bike-heavy places like Portland and San Francisco, I can see a different picture. I’ve not been to Chicago in decades, so I can’t speak to its bike culture. On the rare occasions I find myself on a road with a bicycle lane, I’ll try to use it as long as it’s just as worthy as the main traffic lane, and sure, I feel like there’s a little buffer there, but at the same time I get a distinct sensation of “us versus them” that I don’t normally feel when I’m just riding along my usual commute route. 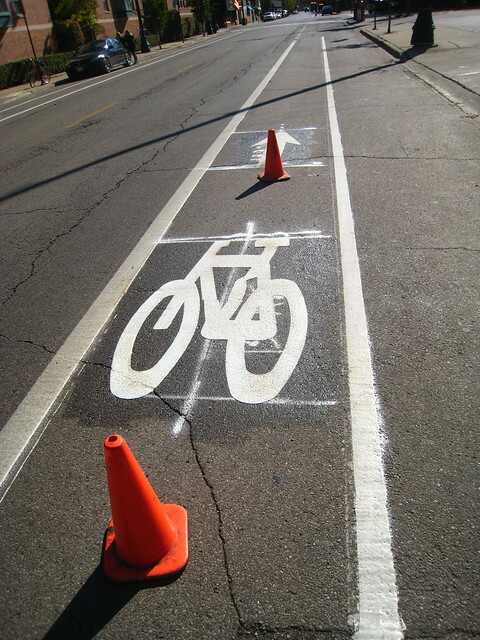 Oh, and one last thing, especially regarding those giant, gawdy icons painted in the middle of the bike lanes: Have any of you ever had the misfortune of riding over street marking paint with skinny road bike tires right after it rains? Yeah. Fortunately Chicago is making strides in becoming much friendlier for bikes. Planners from Portland and SF were both in town to help get us started for our Bikeways planning initiative. We do have our own challenges here – like winter! I think Chicago is getting better at this than it used to be. I’m sure most would agree that many more improvements are possible. As ever, the toughest gains will be in reducing turning conflicts, but even there, I’m seeing some nifty ideas. Since in my town they are generally smack dab up against a line of parallel parked cars, they are completely useless during regular hours. I don’t want to sound ungrateful, but…. Apparently folks in Bedford, NH, think a bike lane would help there, too. Bike lanes are sorely lacking in this area, but things are getting better. The lack of bike lanes has made me a much better cyclist, in a vehicular sense. I am an advocate of taking the lane, and I like to think it gets me drivers’ respect. There’s a bike lane alongside a major highway in Crystal River. It’s great, except when drivers want to turn right at a T-intersection. I learned really quickly to take the lane until I go through the light. This same lane has a bike box not two miles east. Weird planning. Almost non-existent here. Although they added one down a major road a few weeks ago and a lot of people were not impressed.